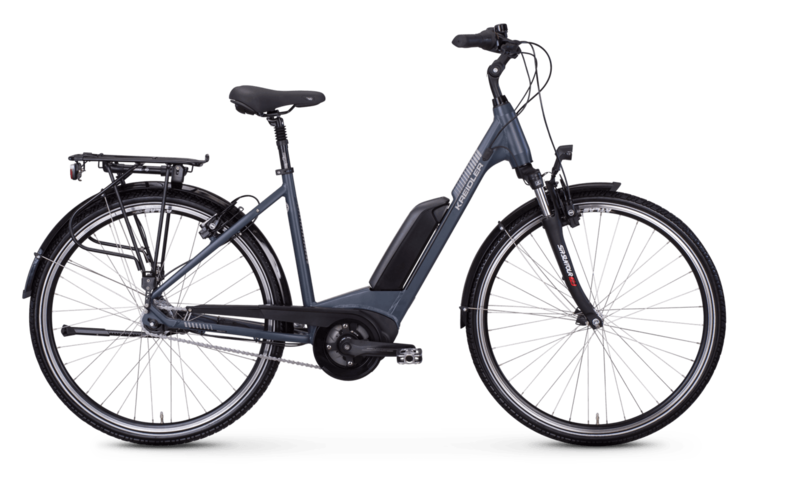 This e-bike does not have to hide from more expensive competitors: The Vitality Eco 1 with back pedal brake is driven by the reliable Bosch mid-engine of the Active Line. It provides powerful, dynamic support. The battery with 300 Wh offers sufficient range for trips in the city and weekend tours. The Purion on-board computer is easy to use and allows you to switch between 5 different driving modes. At the same time, the clear display provides a lot of useful information, e.g. range, driving time or speed. The high-quality aluminium frame of the e-bike is also convincing and impresses with its particularly high stiffness. Equipped with a suspension fork from Suntour, a sprung seat post and a smooth-running 7-speed hub gear from Shimano, the Kreidler Vitality Eco 1 offers a particularly attractive price-performance ratio. In addition, the combination of the hydraulic Magura rim brake with a proven back pedal brake convinces with powerful, precise braking behaviour. The maximum permissible total weight of the e-bike is 140 kg.